MC Hammer once had a song called "Can't Touch This". If I were to write a song about this game, it would be titled "Don't Touch This", as this is one of the worst playing games I ever laid hands on. You're probably wondering why I would even play this game. Well, it was lying around the house, and NO, it's not mine. But for laughs, why not review this game. Going in, I knew it wasn't going to be good, and for the brief time I could tolerate it, it's pretty bad. Bad for even a kid's game. The first strike against the game is the fact that it really has nothing much to do with the Yu-Gi-Oh card game. Rather, it's the typical 3-on-3 style of role playing battles seen many times over. The second strike is that EVERYTHING in the story is in text. That would be fine if it were a game for advanced audiences, but again, this is a kids game, and I'm not too sure if every kid who plays this can read and understand what is written, if they even have the patience to read the text, which they probably won't. The battles are simple but lack complexity. It's simpler than a Pokemon title. The interface is confusing and somewhat non-functional. I was never sure if what I selected and wanted to do was ever confirmed, because the menu layout and design just doesn't work. This really isn't a fun game at all. Oh, and Konami must be insane, as you have a choice of two characters to play as in the beginning (like that f---ing matters), which means you can play through the game TWICE! Oh rapture! Things in the visual and audio department don't help the game out any further. The visuals are pretty stripped, almost like a sparse N64 game using the expansion pak. The character models are decent and there a few effects that don't look too bad, but the lack of environments and the canned animations just don't do the game any favors. On top of that, there are no cutscenes, which is a bit odd in this day and age of RPGs. The music is average and the effects lack any impact, what a surprise. Absolutely no voice work to be found, which may be a good thing, because I hate the cartoon, and to have those voices would drive me crazy. 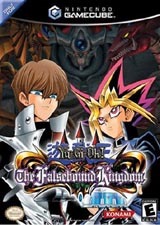 Before you get on me about trashing this game simply because I hate the Yu-Gi-Oh franchise, let me say this: if you stripped off the Yu-Gi-Oh! license and replaced it with a Mario, Mega-Man or even (god forbid) a Zelda license, it would still be an awful game because the design is poorly conceived. The fact that it just so happens to involve the Yu-Gi-Oh! brand made my day a little brighter. Now, let's never speak of this again and find a game that's actually GOOD. Let's just forget this even happened.